Lets look at some charts. I like charts and graphs. Below I've got charts of 4 different investments and their growth from 1990 to 2007/2008. I normalized them starting in 1990 at a starting point of 1. 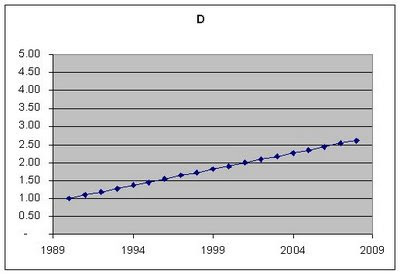 I then show the growth rate in future years in multiples of the initial investment. So if you start with 1 in 1990 and it hits 2 in 2008 then that means it doubled in price in that time. If you'd put $1000 into that investment then you'd have $2000 18 years later. OK so now lets look at each of the investments labeled A, B, C & D in turn. This investment was pretty flat for the first 14 years. It actually lost money over the first 12 years and then recovered back to its initial price a couple years later. In the last 5 years the investment started to grow pretty well and it more than doubled in that time. Investment A was up 134% in 18 years for an annual growth rate of 4.8%. 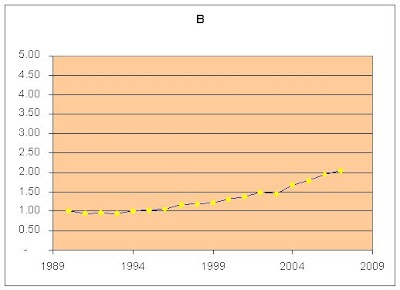 Investment B: The chart shows the growth of Investment B over the period from 1990 to 2007. 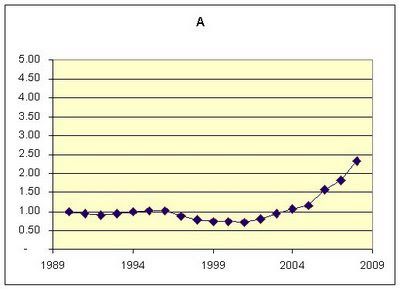 Investment B grew at a pretty gradual and steady pace over the full 18 years from 1990 to 2007. In the first 5 years it was pretty flat and didn't gain. But then it gradually grew more and more. Investment B was up 104% in the 17 years for an annual growth rate of 4.2%. 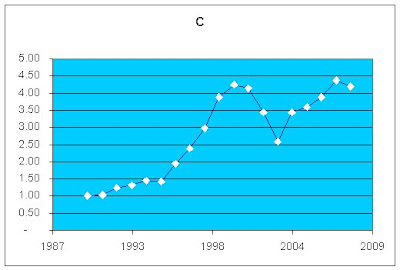 Investment C grew quite well over the 18 year period. From 1990 to 2007 the investment was up 319%. Thats an annual growth rate of 8.2%. However the investment was more volatile and had large swings in annual ups and downs. In just a few years from 2000 to 2003 the investment lost over 38% of its value. The returns on Investment D were very steady and had no swings in volatility. From 1990 to 2008 the investment received an compound annual growth rate of 5.5%. Now lets compare and contrast the different investments. Investments A, B and D all had similar return rates. The charts look relatively similar with gradual increases over the 17-18 year periods without much wide swings in values. Investment A had the longest period without growth and took the largest dip in value. Investment D had the steadiest growth and didn't drop in value at all. Investment D grew the most and was most consistent. Investment C was the clear winner in terms of overall growth. Its growth rate of 8.2% was far above the other 3 investments. However investment C also had the widest swings in value and the largest drop. Whats best A,B,C or D? If you compare the investments C looks the best in overall rate of return, but it has high volatility thus high risk. Investment D appears better than A or B since it has higher returns and the returns were steady with no volatility. Investment C and D are the better choices for different reasons. Investment C gives you a good safe, steady return and investment D gives you high growth with some risks. I'm sure some of you can guess what investments C and D are. Investment C is the stock market, specifically S&P 500 index fund. Investment D is a AAA rated long term bond. Investment A and B are probably harder to pick. Investment A is gold and Investment B is real estate median home prices. I don't think that anyone should walk away from this with the idea that Bonds are better than real estate or gold. Each class of investment has its own pros and cons. Bonds are a fixed return and have low risk, but theres also no up side. Gold or Real estate have the potential for higher earnings in a boom. Stocks have a lot of potential for high earnings and a lot of risk for losses. I guess my point is that if you are looking at the returns of an investment then you should look at the general trend over a long period of time and consider the historical volatility as well as historical returns. Don't think that gold going from $300 to $1000 an ounce in 8 years is a normal trend. Don't think that stocks losing 40% in a year is typical either.